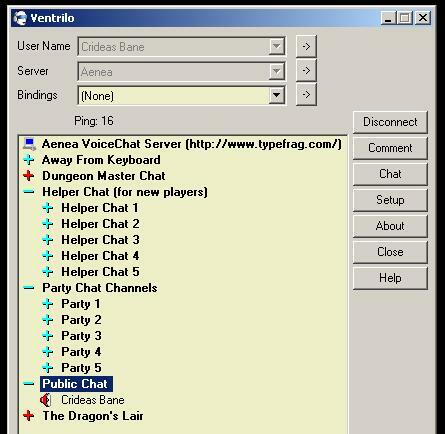 Exciting New Voice Chat Server for Aeneans! 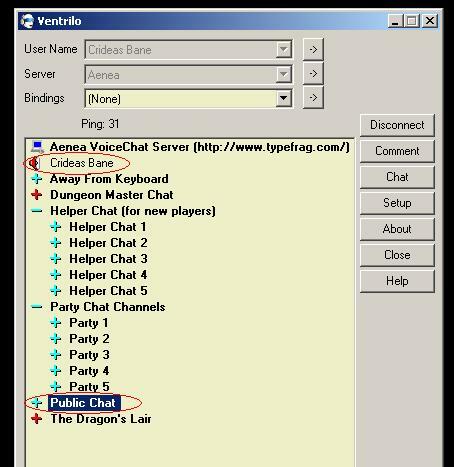 I am very pleased to announce the grand opening of the Aenea Voice Chat server! The server features crystal clear, high quality voice chat to help you communicate with other players of Aenea, whether it be general conversation, helping new players or party coordination! No more pesky typing in the middle of combat! 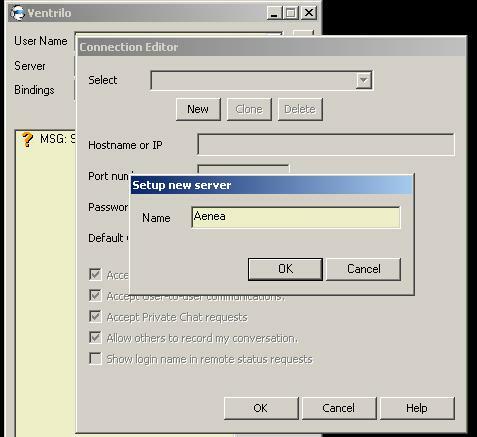 To access the server, you will need to download the Ventrilo Voice Chat client. Get it here. This will bring up a window where you can click the "new" button to enter your desired username. Please enter a character name here, as this will make it easier to recognize who is who on the server. You can make a new username for each of your characters. Pop in your character name here and hit "OK". 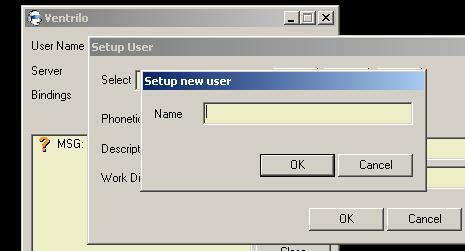 This will bring you back to the previous "setup user" window, where you will again click "OK". This in turn brings us to the window where we can enter a name for the new connection we wish to make for our username. 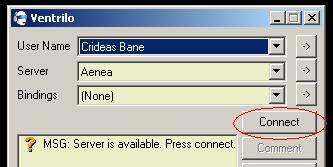 Enter "Aenea" here, then click "OK". The password is all lowercase. I also recommend disabling the checkbox for "allow others to record my conversation". Now you will be back at the main ventrilo window again, and ready to log in!! After you connect, the Message of the Day will pop up. Please read it. The rules for using the server are very simple and straightforward. If you are in doubt about something, please ask before you do it. 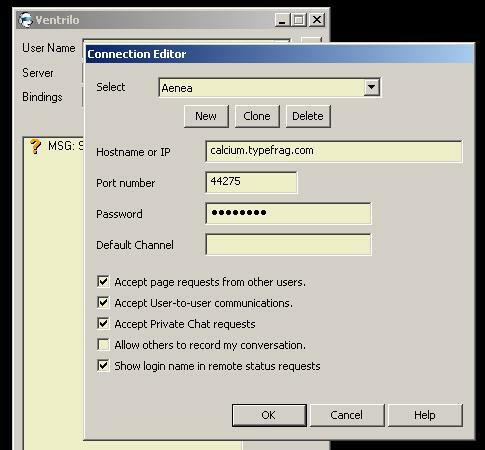 Now that you are connected, the main ventrilo window will show the various chat channels available, and also what other users are logged in and what channel they are currently in. Now you are all set to start chatting with your fellow Aeneans! Bear in mind, the program by default will only allow you to talk by holding down a "push to talk" button. If you click the "setup" button, you should be able to see what key it is, and also disable this function if you like. If "push to talk" is disabled, ventrilo will transmit whenever you speak into your microphone. There is a "sensitivity" setting that you can adjust to make sure ventrilo only activates when you speak, and not when you breathe, or when there is background noise in your area. It is important to realize that the LOWER the "sensitivity" setting is, the MORE likely ventrilo will transmit upon any sound reaching your microphone. I will make another post to go through some of the basic "settings" you may or may not need or want to use. Keep checking these forums for the next update! Lastly, should you be logged into the server and have an issue with another user harassing or annoying you, you can "MUTE" them and go about your business. Simply right click on their username, go to "user" and then click "mute". If you mute a player and they log off, create a new account, and come back to harass you, you can globally mute ventrilo using the "mute sound" checkbox at the bottom of the ventrilo window. If this happens, please contact myself or in game, or through a private message on these forums and we will resolve the issue. Most likely with a ban of the problem user. Hope to talk to you on vent soon! Re: Exciting New Voice Chat Server for Aeneans! My problem is that I play in the bedroom, frequently after my wife is asleep. Talking to others after 10:00 pm could be problematic for me. Thanks for setting this up, Dave! That was fast! And the setup tutorial rocks. Svair...move your computer to a different room. I feel your pain, Svair! I dunno, it sounds really cool (be a lot easier to carry on conversations), but at the same time - call me crazy - but I imagine everyone's voices in my head. Y'know, it's like reading a book and imagining what the characters look like, and then seeing the movie - kinda weird. Very cool, but kinda weird! I'll have to dig out some headphones and find a spare microphone in the attic! daveyeisley, you are truly a beast among men! kudos to you! The Amethyst Dragon wrote: Thanks for setting this up, Dave! That was fast! And the setup tutorial rocks. I live but to serve, milord. I find it somewhat humorous that this addition of technology actually makes my Aenea experience closer to my PnP days. 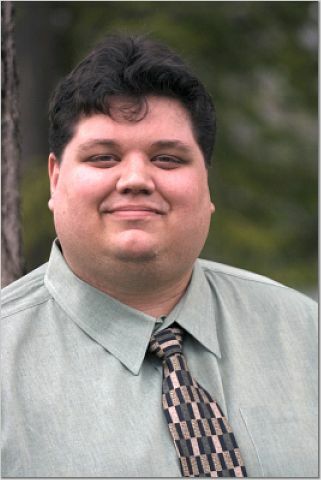 Now once again I can attempt to suspend disbelief that my old PnP gaming bud is actually a charismatic elf. 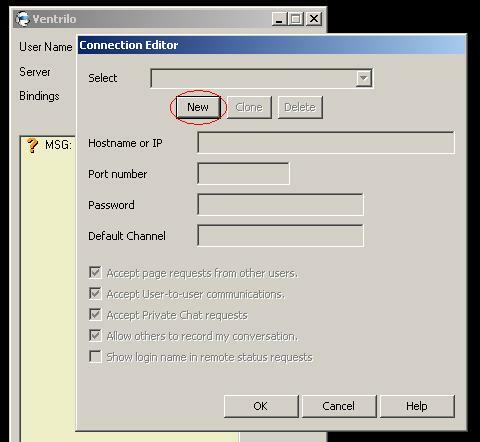 I was thinking about it, and I realize that if somebody logs on and they need help with "configuring" settings in ventrilo, it would probably work best to just have them post on these forums requesting help. That way, one of us who is familiar, or has become familiar with the settings can try and help troubleshoot in real time over ventrilo. As everyone's hardware and micrphone/software will be different, trying to post a somehwta detailed and comprehensive guide to configuring the settings would be problematic. FYI, if you cant get your mic to transmit, there IS a text chat function you can use to communicate. 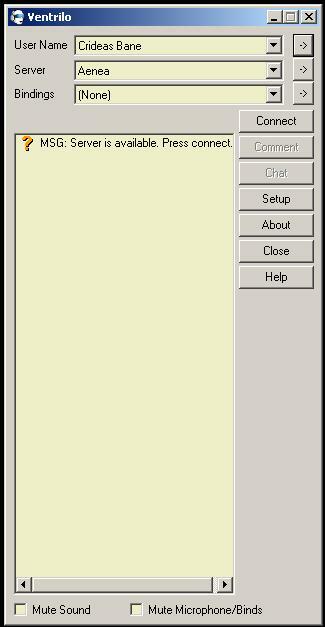 Just have both people click the "chat" button on the main ventrilo window and you will both be put into a basic text chat window. Just installed and configured ventrilo! I don't have a mike yet (soon, very soon! ), but I have dedicated headphones! I had my reservations at first, but after installing and implementing the Ventrilo software I've been mightily pleased. I added an in-game toggle to the VC command system. You can now set it so that the info whereall command will display whether you use the voice chat [Voice Chat: Full] or you just use it to listen in, aka no microphone [Voice Chat: Listening]. The default, if you don't set one of the previous two, leaves the flag off in the character listing. You can change this setting by typing option wvent into the chat bar. If you do use the voice chat and you are working with someone that doesn't have it, please be courteous and explain everything you are verbally discussing in-game (with text). We don't want those without to feel like we are ignoring them or that they are missing out on important information. My sound settings were goobering with NwN proper, so I disabled them. On the downside, I canna hear nothin' from the game, except when I hit the control button - then I am rewarded with a beep-boop. I'll do some experimenting and see what I can hear! has to do with sound channels, specifically, ventrilo trying to utilize the same channel as NWN. Ventrilo SHOULD be checking with your sound drivers and creating its own, separate channel. I believe the way to correct the issue is on the setup page when you click the "setup" button. In the upper-right-hand corner of the "speech" tab, there should be an option to "Use direct sound". communicate with the sound card in its own channel. Try that, and let me know if anything changes. Just to make sure Eric catches the edits... I will delete this when he responds. Thank you for your investigations. While poking around myself, I discovered that for whatever reasons, the port wasn't set to the proper number. After I reset that, the appropriate info appeared in the boxes. It was late at night, and near my bedtime, so I didn't have a chance to check it proper. I work mornings the next few days, so I'm not sure when I'll be able to investigate further. Thank you, however, for keeping me in the loop! Just set this up on my laptop - thanks again for the great tutorial! Perhaps we'll be chatting soon! The ventrilo epidemic is spreading! I set it up on my computer, but it's not working. I am no expert, but I followed the instrucitons, and it says I am online, but no noise emerging from my speakers. I may need your help Dave. Skywatcher, next time I catch you in game and have some time, we can try and go over your settings. If you click the "setup" button, a window will open that makes available *many* ways to customize or adjust the client. On the upper right hand area of that window you will see options for input and output devices, each with its onw drop-down menu. On those menus should be the various drivers installed on your computer for sound devices. Make sure that ventrilo isnt using the wrong driver to try and interact with your sound card. It is doing something funky. I turned it on and tried to launch NWN and it crashed. Oh well, I am sure I need to change some esoteric setting that you can set me straight on in moments, once we get together. Just giving this a bump to remind people of this capability. I do use it about half the time I'm in the game. My play time has been rather limited lately (with student teaching and the holidays out of town), but I do use it, at least to listen in sometimes. I'll try to use it more often. When I log on, I usually check to see if anyone else is using it. My ability to use it is somewhat limited though...usually after 10:00 pm PST when there's finally a quiet room in the house. I will use it when there are other people on it myself. I tend to not use it too much though as for some reason, ventrillo will seriously degrade my game's performance (it'll be fine for a half hour or so, and then suddenly my framerate will tank to a crawl. Sometimes i'll go an hour and be fine, sometimes the framerate will tank after only 10 minutes even). Its gotta be a Vista thing. I use XP, with a single core processor, and they run fine together. daveyeisley wrote: Its gotta be a Vista thing. I am running WinXP with an Athlon 64 X2 4200+ and I've not had any problems. Na, I *used* to have Vista, but had that whole lost disk/reformat fiasco earlier this year remember? Running XP now, and have the problems. I had no problems with vent on vista. Well its gotta be an issue with your system then... not sure what else ya got running in the system tray, or maybe its a service in the background eating up resources. You got maybe Norton 360 or another security/protection suite on there? When you play games online, those programs never seem to realize the PC is in use, and take it upon themselves to run updates and whatnot... which usually kills performance. When you close the game down and restart it, the update process gets paused or cancelled because the process has been ended and restarted causing the protection software to register the system is in use again. MannyJabrielle wrote: Na, I *used* to have Vista, but had that whole lost disk/reformat fiasco earlier this year remember? Running XP now, and have the problems. I had no problems with vent on vista. Hmmm... did you check to make sure you have the latest drivers for all your hardware, especially your sound card and chipset? Or, better yet, do you have a standalone, dedicated sound card? Sound "cards" integrated on the mobo can cause lag and stuttering... Also, make sure Ventrilo is using DirectSound, that's usually your best bet for sharing sound hardware. Not my antivirus, certain of that. Might be the sound, but all the various driver versions I've tried degrade sound within the game, and the gameplay is more important to me than a possible fix to a auxiliary program It's not too much a hassle really to restart if the framerate goes down the drain though when using vent. Less hassle than trying to get it to work with NWN considering howmuch I actually use it (no microphone), so I just listen in at best. I'm still using it, but I haven't heard anyone on it for about 2 weeks now. It's a great tool, especially when "partying" with other players. I had to reformat my machine a while back, forgot all about this, hehe. Plan to reinstal it tomorrow, and should have a new headset/mic soon woot! There was no coughing, sneezing, or bodies furniture shuffled about. And who doesn't like Polka music? finally got it reinstalled, might have to give it a try after dinner. Hope to pick up a new headset tomorrow, along with the video card and memory I need to get, as long as those aren't to pricey. Then I'll be able to talk again, lol. Does anyone still use it?? I don't use it as often as I'd like...but then I don't have time to log into the game as often as I'd like right now. It's a great little utility to have and makes communication in-game easy, even if all you can do is listen in. MAn - i'm gonna check if anyone uses that 'whatsitnamer' and if yes - i'm buying a new microphone (old one has a broken cable and i have to stick some crayons with a sticktape to stiffen it). And talk!!!!!!!!!! uuouou yeah! Really handy especially for me while i have to practice my english and it is the best way to do it - just conservation. When you group up with someone, you can always ask them if they would like to join you in voice chat. its great for coodinating tactics in a party. Hehe, I finally got a headset.... From Radioshit, er Radioshack. Hence, it's a POS.... the mic on it doesn't work at all. The earphone part just fine, but not the mic. Oh well. I wanted to give an FYI, and offer assistance to those who have had or are having issues with getting ventrilo to work properly. It is usually difficult and often frustrating for both parties when a user and a technician attempt to resolve a software issue using text or voice only. I have my own business doing PC repairs, so I am well aware of how challenging it can be. One of the things my business can now offer, and as such I can now offer to all of you, is Remote Support. While I charge for my time when actually fixing computers, I am happy to offer this option for FREE to users in Aenea to fix issues with ventrilo, or other minor things. I can help you set up your own remote access account, which I would need the password to if I am to be able to help you, and using that account we can then have you download and install the needed software. If, when we are done, you do not wish the software to remain on your system it can be easily uninstalled at your convenience. For those who might be concerned about security- as a businessman, technican, computer afficionado, and generally decent fellow... I assure you the software is safe and secure and would not allow me to make a "backdoor" into your system. It is solely for the purpose of allowing me to see what you see and directly interact with your system to fix any issues. It can also be set up so that anytime a remote user wishes access, the current user of the system must give explicit permission or the request is denied. If you have ventrilo problems and are interested in persuing this option, send me a PM and we can discuss how to proceed. Another nice thing about the USB one I use is that it had a Volume Control as well as a Mute control right on the wire for the headset, so you don't have to use the computer to adjust it. There are less advanced and cheaper ones available as well. Here are links to 3 different headsets ranging from $10 to $30 in price. Remember that you will probably get what you pay for, but if you have nothing else, even a cheap $10 headset will get the job done. As I mentioned above, if you happen to pick up any of these or another headset and it is not working for whatever reason, catch me online and I will be happy to try and get it working for you, if needs be through a remote support session. And if you're looking for a really nice setup, and can afford it, here is another one I am looking at picking up. I also see there is a nice $15 mail-on rebate if purchased on or before 3/21/2011. I think I may have to jump on that.... so if and when I get it and its all set up and working nice for me.... I will have a spare headset if anybody wants it. The ventrilo server got relocated from NY to Amsterdam without my knowledge or consent, and in the process was switched off. I found the issue and restarted it, but please let me know if there is performance degradation or issues, as I believe I have valid grounds for a complaint in that regard.